Have you experienced the hassle of your company’s unplanned IT dropping unexpectedly? Can you recall how big a nuisance it was to be completely unable to conduct any business when technology lets you down? When IT fails (and it inevitably will at various points), the consequences go far beyond the mere irritation of waiting for it to be restored. Even a short amount of unplanned downtime can cost a business thousands of dollars in lost productivity and sales. Let’s say, for instance, a business experiences one hour of downtime. This can be multiplied in terms of lost productivity as everyone in the company is idled for 60 minutes, so the cumulative productivity loss amounts to numerous hours. When the loss of productivity is coupled with the absence of sales that would likely have been achieved in that hour, downtime costs can climb to $50,000. You could argue that the total cost is even higher when you factor in reputational damage and the loss of future business from disgruntled customers who experienced frustration at not being able to buy from you during the hour of IT downtime. Nor are technological problems the sole preserve of small and medium-sized businesses. Research from Dunn & Bradstreet showed that more than half of the companies on the Forbes 500 list experience, on average, 1.6 hours of downtime every week. Yes, these might be multibillion-dollar enterprises for whom mere millions are a small change, but it seems hard to comprehend that so many of the world’s top companies encounter IT downtime every week, especially when they have such elite technical teams within the company. This figure is even more unfathomable when you consider that the average annual IT downtime for businesses is 14.1 hours – many of the most trusted brands in the world experience more than four times that amount. The same research calculated at just under $6.5 million the hourly cost of IT downtime for a typical online brokerage firm. If you’re a small business owner, think of the effect that losing $6.5 million in an hour would have. Yes, the scenario might not be directly transferable in this case, as a small business and an online brokerage firm occupy vastly differing business environments, but the figures alone are staggering. 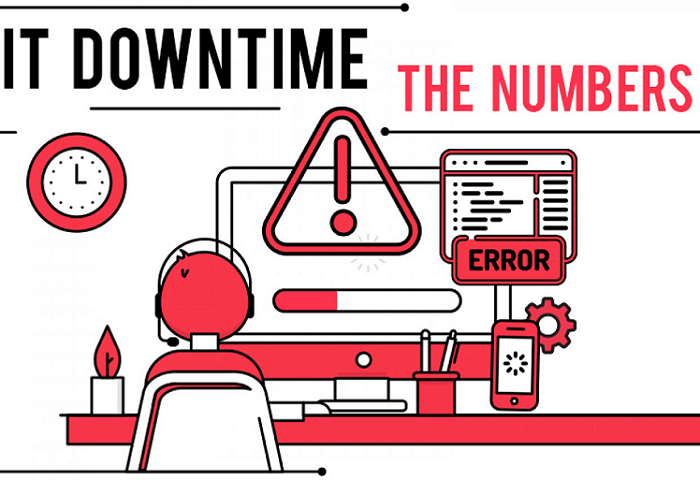 For further statistics on the potentially disastrous consequences and Cost of Unplanned IT Downtime for Businesses, check out the Infographic below from ERS IT Solutions.